SARASOTA, Fla. — Pursuit Boats introduced two new models to journalists this morning. Pursuit Boats engineering director Chris Gratz discusses the improvements the builder has made in the new OS 355 Offshore and the C 238 Center Console. SARASOTA, Fla. — Pursuit Boats introduced two new models to journalists this morning and announced that it will debut its largest boat — a 40-foot center console — and a large dual console model at the 2016 Miami International Boat Show. "At the end of the day, when you take away all the bells and whistles, you want a product that delivers," said Tom Slikkers, president and CEO of S2 Yachts, which owns Pursuit and Tiara. "We keep pushing in areas to deliver new product that makes sense to the customer in innovative ways. You will see some very cool product that is here and on the way." 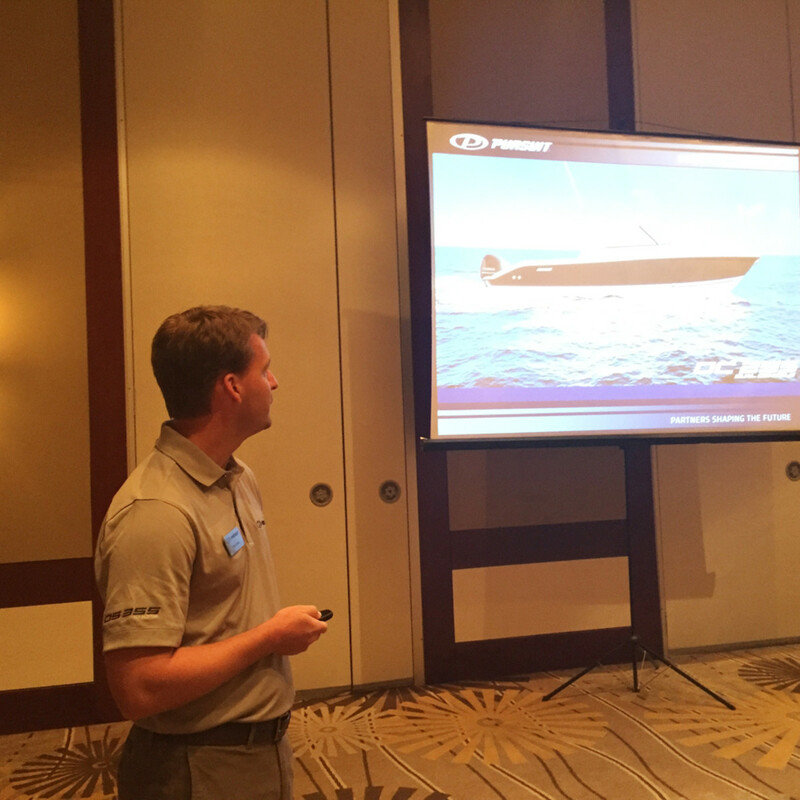 At the Hyatt Regency in downtown Sarasota, the company told 10 media members about the new OS 355 Offshore with twin 350-hp Yamahas. The C 238 Center Console, powered with a 250- or 300-hp Yamaha, was also introduced. The OS 355 is new from the keel up and replaces the OS 345. The C 238 rides on the same basic hull bottom as the vessel it replaces, the C 230. Chris Gratz, director of engineering at Pursuit, outlined all of the improvements made to both new models, using images of the new and previous models. More than 75 changes and improvements were made to the OS 355, including a new windshield with no sightline obstructions, more cockpit seating and an improved helm station, and a larger midcabin berth with more light. Both the C 238 and OS 355 have extended swim platforms. The center console — the S 408 — will be 43 feet overall, with 450 gallons of fuel and a predicted WOT speed of 53 mph without a tower. It will be powered with triple Yamaha F350s. Quads will not be an option. This boat, along with the DC 295 Dual Console, will be introduced at the Miami International Boat Show. The dual console will be powered with twin 250s or 300s. Journalists will be able to test the C 238 and OS 355 today, along with several other models. David Glenn, marketing director of S2 Yachts, reminded his guests that the boats are more feature-oriented than previous models, but are still fishboats. "We are a fishing boat company, and we have not abandoned that fishing market at all,” he said. “We are just making sure they are more comfortable and have more features to serve the family across the board." Pursuit executives addressed the changing needs of the market as well. "Customers expect the same fast elevation of product as they see in the rest of their lives,” Glenn said. “We are bringing new product to the market faster."